Contest: Win a free copy of Battery Saver Pro by MMMOOO! A common complaint you hear among anyone that uses a smartphone, whether it's a blackBerry, iPhone, or Android device, is battery life. There is never enough charge to get us through as long as we would like, but there are several tips you can use to help extend the life of your battery. Battery Saver Pro by MMMOOO will help make these steps for you, so you don't have to think about it. With options for automatically locking and dimming your screen, turning off wifi, radio, applications, and the device itself, you can literally set it and forget it. Battery Saver Pro will do the work for you. This app also acts as a screen saver for your BlackBerry. You can set it to activate when the backlight turns off or you plug in your device to charge. With a large battery icon that you can customize with different colors, flags, or designs, you also get your battery level in percentage, the current time and date. The Battery Saver Pro UI looks slick and is easy to navigate ensuring that you will only activate the tweaks that you want. 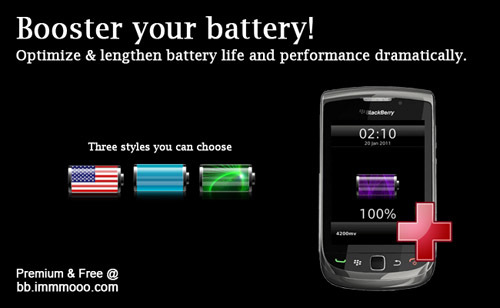 Compatible with most BlackBerry smartphones, you can pick Battery Saver Pro for $2.99 at the link below, and there is a free trial available! Contest: We have 25 copies of Battery Saver Pro to give away courtesy of the good people at MMMOOO. If you'd like to enter to win, leave a comment below. Contest ends this Sunday at midnight PST. Good luck!